Published! …no, wait: Ripped off? | Flickr - Photo Sharing! Published! …no, wait: Ripped off? 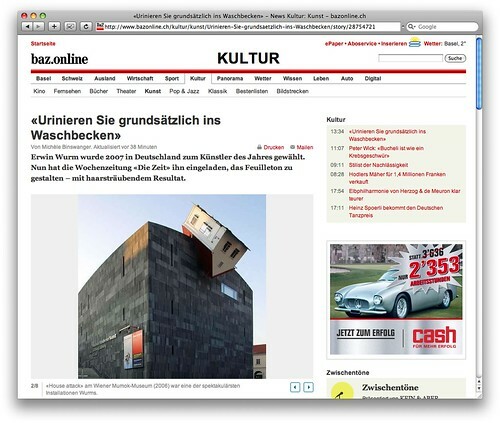 I was happy to see my Erwin Wurm picture in this article* (as well as here and here*) – but less so not to find any proper attribution alongside it, nor a paycheck in my mailbox. I am pissed, quite frankly, I am confident those in charge** will sort this out, and I have taken the appropriate steps. – Updated in the comment section, and blogged by Bö. – Update #3 (new! ): They continue to ignore the copyrights of Flickr users… who's next? 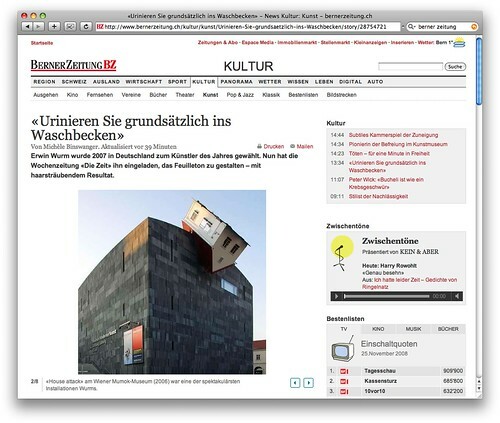 Petition: Join the group «Newsnetz: Please stop using Flickr pictures without asking»! * The image has been removed and replaced in the meantime. The screenshots of two other sites it was used on can be found here and here. ** Newsnetz is the online branch of the Tamedia conglomerate. 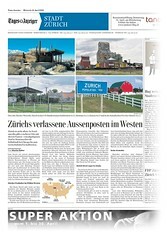 Its associated publications Tagesanzeiger, Basler Zeitung, Der Bund and Berner Zeitung are among the leading newspapers in Switzerland, with a joint circulation of 0.5 million copies. If you find out and complain about them having used your picture, they'll pay you their standard fee. That fee happens to be well below the generally approved rates for image use in Switzerland, and does not include any other compensations for having violated your copyright or the hassle of inforcing it. In my book, that's neither fair nor what we are asking for. Haben Sie dir jetzt nur ihren Standardpreis bezahlt?! …nein, bislang gar nichts. Newsnetz hat mir (im Dezember) die 30 Franken angeboten, doch ich fand das, wie Du, unangemessen und habe diese Summe – mit Verweis auf die SAB-Richtlinien – ausgeschlagen. Seither gab es keinen weiteren Kontakt. ... und der Bilderklau geht weiter, heute im Regionalbund des Tagis, 4 Bilder (über Zurichs in den USA) mit Quellenangabe "flickr"... einer davon hat mir bestätigt, nichts davon gewusst zu haben. Hoppla, nun werden also Urheberrechtsverletzungen auch in der Print-Redaktion salonfähig? Bislang haben (meines Wissens) ja nur die «jungen Wilden» von Newsnetz delinquiert. 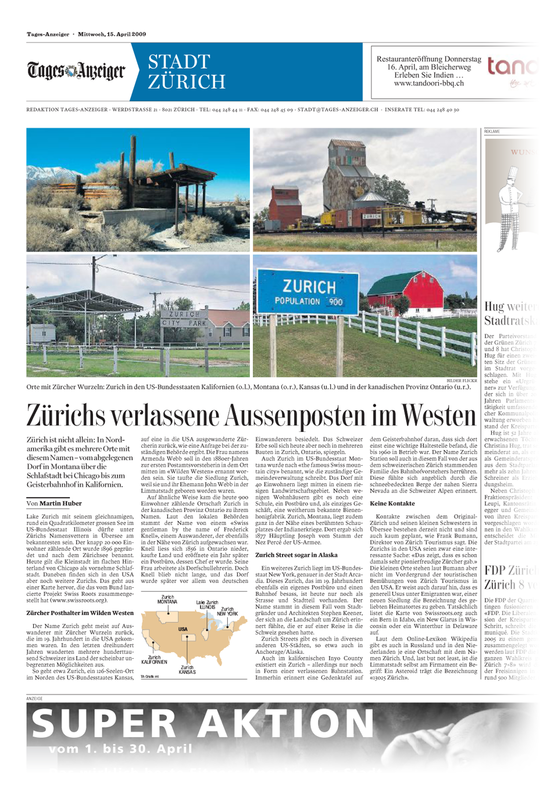 It has come to my attention that in the April 15 edition of your paper you printed a photograph I took of Zurich, Kansas and posted on Flickr in 2007. The Creative Commons copyright license on my photograph states explicitly that the photograph is licensed only for non-commercial use and that any use must include attribution. No one contacted me to seek permission to use this photograph and there is no attribution to me as the photographer. I am easy to contact through Flickr. No attempt was made. I am deeply disappointed that a professional news organization such as Tages Anzeiger would flagrantly ignore copyright law. The right thing to do would be to print an apology, retroactive attribution, and provide appropriate compensation in keeping what what you pay your own staff photographers. Sadly, given the cavalier disregard for intellectual property rights you have displayed, I do not expect you to do this, but I sincerely hope that you will educate your staff to stop stealing the photographs of others for commercial gain. Your behavior is both illegal and unethical. Creative Commons copyright and public domain are not the same. If you wish to have your ownership of your own articles respected, you must respect the intellectual property rights of others. Wow! Well written and to the point. I wholeheartedly agree with every word of your letter. 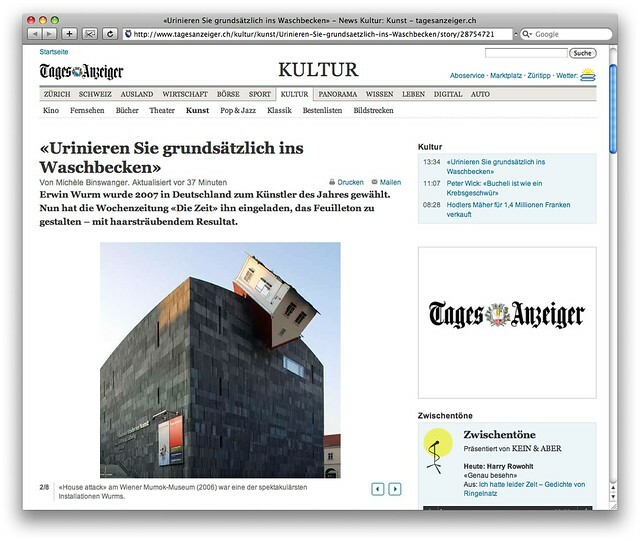 I guess Nancy's letter hasn't arrived in Zurich/Switzerland yet, the newspaper printed user Georges Aerts' photo again in last Saturday's edition, without proper attribution. …they seem to have no shame.